Ecuador changed their national currency in 2000 from the sucre to the US dollar after the sucre’s exchange rate dropped 70% in one year. Now at the whim of the US economy, the currency change can still be a gamble. But most people will say that now, at least, it’s a good thing. Mathematically-challenged estadounidenses traveling to Ecuador are alleviated from any conversion obstacles, and may find that a dollar here goes a bit further. Ecuadorian shopping malls and restaurant menus tend to mirror prices in the States. But if you want to cut costs here, you definitely won’t go hungry. As usual, the mercados centrales deliver the best value, where you can enjoy a fresh juice, soup, and entre for a few bucks. But you don’t have to go to a large city center in Cuenca or Quito to eat cheaply. Small-business food stands line the outdoor bus terminal in Otavalo, and a few chairs and a mobile flat top grill add up to a family-run restaurant on the edges of farmers’ markets in small-town squares. When searching for lunch, I never had to look far before a two-dollar plate of llapingacho became my 3 o’clock savior. 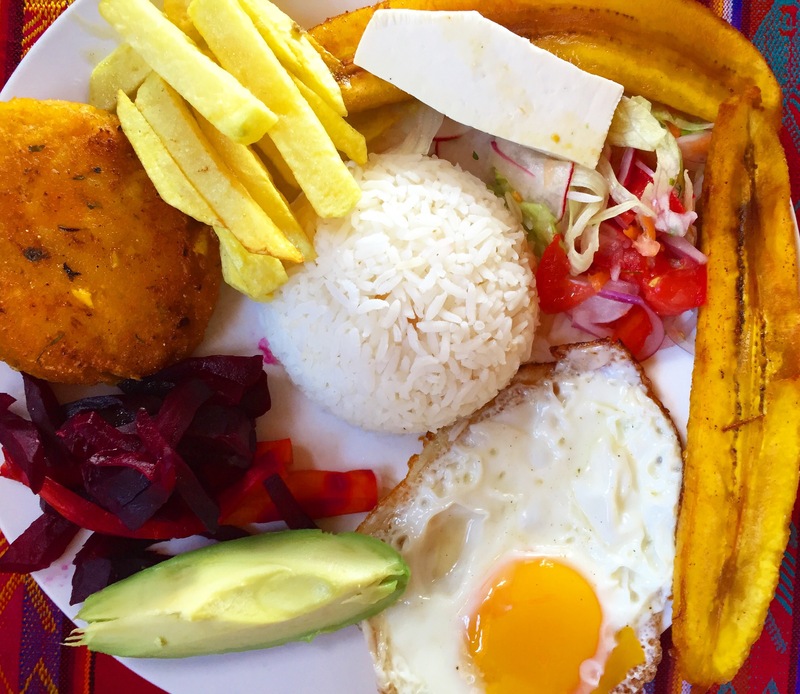 The dish traditionally includes sausage, but ask for llapingacho vegetariano, and you’ll find a plenty-full plate of fried potato patties, avocado, beets, chopped tomatoes and lettuce, and rice topped with a fried egg. In fancier parillas and cafes, you might even encounter some plantains and a slice of queso casero. Just as one abuela’s recipe differs from another’s, the plate’s typical assortment varies, sometimes with habichuelas (green beans) and other vegetables replacing the heaping scoop of white rice. I ate llapingacho for five days straight in Baños, a tiny tourist town in central Ecuador. Inside the one-story mercado central, the ladies cooking beside plastic picnic tables all offer identical menus, with llapingacho sin carne as the sworn-by veggie option. South of Baños, in Cuenca, the market reveals a sudden gastronomic shift from neighboring Peru. Sopa de quinoa and ceviche disappear from banner-like menus that hang from the ceiling, replaced by thick, butter-packed tortillas de choclo and uncountable variations of sopa de gallina. Up north, in Quito, the historic center’s market is dominating: a full second floor crowded with restaurant stands and aluminum tables. Full families crowd around to sip soups and fruit juices and dive into piled-high plates. No matter what you order, every two dollars exchanged mid-day for a packed plate promises a full stomach until late into the evening. You may strive to find room to squeeze in an enticing sweet empanada or alluring homemade taffy sold on the sidewalk. But it’s always better to wait, stay another day, and then taste even more. Another serving of llapingacho is readily available wherever you’re able to pull up a chair.